Luke Fickell wants to make UC football great again. If he succeeds, will he stick around to enjoy it? When the University of Cincinnati hired Tommy Tuberville as its head football coach in December 2012, it gambled that a 58-year-old former coach of Ole Miss, Auburn, and Texas Tech with little left to prove could match the vigor and success injected into the program by a trio of up-and-coming predecessors. From 2005 to 2012, Mark Dantonio, Brian Kelly, and Butch Jones led the Bearcats to five double-digit win seasons (something UC had achieved only once before in program history), four Big East titles, and earned a pair of Bowl Championship Series bids. 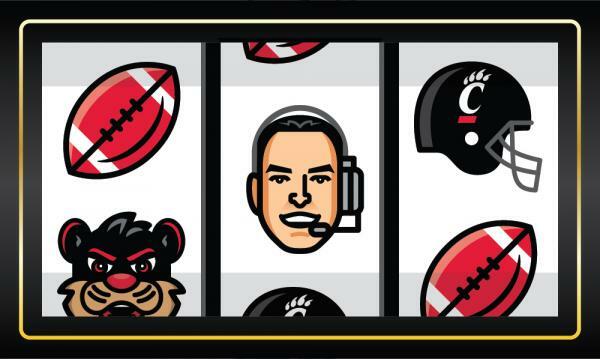 The downside—and reason for rolling the dice with Tuberville—was that all three also parlayed that success into head coaching jobs with more prominent programs, leaving UC and its revived fanbase feeling like thrice-jilted lovers abandoned at the alter. The bet backfired. Tuberville “resigned” in early December of last year after a disappointing 11–14 stretch in 2015–2016 marred an 18–8 record in his first two seasons. Less than a week later, UC athletic director Mike Bohn tapped 43-year-old Ohio State defensive coordinator Luke Fickell as Tuberville’s replacement, returning to the blueprint that yielded Dantonio, Kelly, Jones, and a burgeoning college football powerhouse. Fickell’s on-field product can’t be judged until the Bearcats open their 2017 campaign on the final day of August, but his off-field impact has already turned heads by succeeding where Tuberville failed: recruiting locally. Per recruiting site 247Sports.com, Tuberville reeled in six Cincinnati-area recruits during his entire four-year tenure. Six! A paltry 9 percent of Tuberville’s recruits hailed from the Queen City, and only 24 percent were from Ohio. Compare that to Dantonio (20 percent from Cincinnati/48 percent from Ohio), Kelly (29/49) and Jones (17/28), and Tuberville’s shortcomings begin to seem self-inflicted. How has the Bearcats’ new hire altered the hearts and minds of area high school players and coaches so swiftly? Aside from a renewed focus on local prospects that stalled under Tuberville, the combination of Fickell’s developmental pedigree at Ohio State (a perennial NFL pipeline) and what former UC quarterback Tony Pike refers to as the “snowball effect” are fueling strong early returns. Fickell is still battling uphill. Dantonio, Kelly, and Jones enjoyed the spoils of playing in the then-power-conference Big East: more TV money, clearer path to big-time bowl games. Fickell has no such luxury in the second-tier AAC, though he wasn’t shy about stumping for the conference’s on-field product outshining its outsider status, evidenced by AAC teams toppling traditional powers Florida State, Oklahoma, and Penn State in recent seasons. So let’s believe it too, at least for a moment: Fast-forward three years and assume Fickell has wrought prosperity on par with what Dantonio, Kelly, and Jones all brought to UC. Will he leave, too, cashing in his success for a more lucrative, high-profile gig? It’s a very real possibility. But perhaps the more appropriate question is, should the Bearcat faithful care? More wins equal more revenue, more exposure, and a better shot at a power conference when the next round of realignment arrives. If Fickell bolts, the school and its fans should thank him for his service—and then find the next ambitious young coach to carry the ball forward.